At the September 2010 meeting of the Thames and Field Metal Detecting Society, I was lucky enough to see this wonderful artefact, which had been found on the foreshore at Rotherhithe, by one of their members. The TDP have also recently been working here during the last week of our Summer Season. 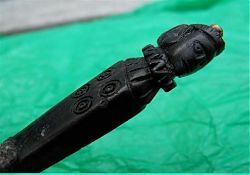 The item is a bone knife handle, and looks to be Tudor in date, given the design of the ruff around the lady’s neck. Check out the Thames and Field website for more images of their recent discoveries, there are also a number of video links including Nick and Steve’s ‘Medieval Breakfast’ which was filmed at Charlton.